Despite the best efforts of Glamorgan’s bowlers, Essex battled through for a draw in overcast conditions in Cardiff as a pulsating match ended in slightly low-key fashion. The visitors finished on 160-5 when the captains shook hands for a draw at 5.45pm. Dutchman Timm van der Gugten enjoyed his best match in a Glamorgan shirt since signing for the county, taking two second innings wickets to add to his first innings 5-90, but it was not enough for the home side. Nick Browne (71) anchored an Essex final day rearguard that had its fair share of scares – they were wobbling at 46-3 when Ravi Bopara nicked to slip off van der Gugten – but finished comfortably. Earlier, Will Bragg remained unbeaten on a career-best 161 after steering Glamorgan to a formidable 386-8 declared. Before that match-defining innings, Glamorgan were behind the eight-ball, having been dismissed for 262 and allowing Essex a first innings lead of 53. That the Welsh county were unable to press home their advantage on the final day reflects their low confidence. 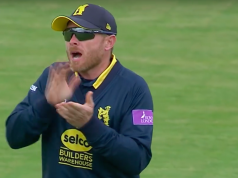 Three defeats and two draws from their opening five matches meant Robert Croft’s team would have been desperate for a win, but it was a much-improved display from Glamorgan in all facets. Galvanised by van der Gugten and Bragg, they had wrestled control of the match by Day Three. Essex appeared to on top, en route to a sizeable first innings lead when Tom Westley and Ravi Bopara (both 80) were cruising at 233/4 – but back came Glamorgan. The Welsh faithful may have been surprised to see it, but Essex wickets began to tumble late on Day Two. Van der Gugten snared five, while the ever-reliable Graham Wagg and Michael Hogan got two apiece as Essex’s final six wickets fell for 80 runs. Only visiting captain Ryan ten Doeschate – who marshalled the tail and smeared 48 before falling on the third morning – provided lower order resistance. Essex’s meagre lead of 53 was a product of Glamorgan’s best bowling display of the season. And it was quickly eradicated by the Welsh side’s batsmen, who also gave a better account of themselves. Despite losing skipper Jacques Rudolph for a 12-ball duck, Bragg joined Mark Wallace for a hundred partnership before Wallace nicked behind for a well-made 40. The pair took Glamorgan from 2-1 to 109-2. Chris Cooke arrived and played in typical Chris Cooke fashion, smoking an attractive 59 in another century stand with Bragg. When Cooke was dismissed, trapped lbw by the dangerous David Masters, Aneurin Donald took up the mantle – and piled on a third successive century stand with the metronomic Bragg. Glamorgan added quick runs on the fourth morning, but Donald fell for 55 and Wagg a breezy 25, with Craig Meschede and Andrew Salter following suit. The home side perhaps left their declaration a touch late, leaving themselves 70 overs to bowl and 334 for Essex to win, but van der Gugten again led the charge steaming in from the River Taff End. 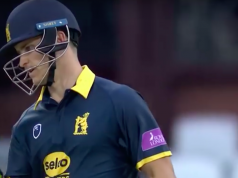 He twice found the edge of Essex bats, with Michael Hogan doing the same, before the spin of Salter and Wagg’s part-time stuff clinched a wicket each. 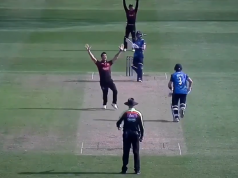 For the league-leaders Essex, captain ten Doeschate stood firm with Jesse Ryder to secure a precious draw. For Glamorgan, a mixture of frustration and encouragement after a much-improved display.